God asks that you let your body, mind and spirit relax in His Presence. He loves you. Can you imagine how much God loves you? I know I can't fathom the depth of God's love. Although He tells us how much. First, let's find out why. 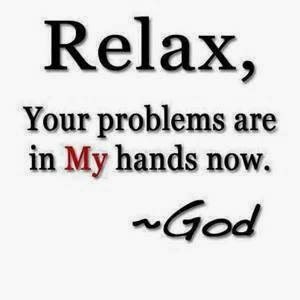 He tells us in 1 Peter 5:7 "Cast all your anxiety on Him because He cares for you." How much does God love us? We have to search Ephesians 3:16-19 where the apostle Paul writes "I pray that out of his glorious riches he may strengthen you with the power through His Spirit in your inner being. So that Christ may dwell in your hearts through faith. And I pray that you, being rooted and established in love, may have power, together with all the saints, to grasp how wide and long and high and deep is the love of Christ, and to know this love that surpasses knowledge - that you may be filled to the measure of all the fullness of God. But I can feel. I can feel God's love. Think of the deepest ocean, the highest mountain, the widest valley, the longest road and you still wouldn't come close to how much God really loves us. Thank God for His love. Thank God for His blessings. Thank God for Him. I thank Him for you. When you sit quietly in God's presence, you are opening yourself to receive God's blessing. Can you feel it enveloping you and making your heart swell? God travels with you through all your journeys. The high road. The bumpy road. The rough times. The good times. Everything you do is because of Him. Can you understand that? Can you accept that you need God? When you have learned to thank God for all the hard times and the good times. When you have learned to thank God for your difficult journeys then, and only then, have you realized that to need God is the key to knowing Him, intimately. That is the gift of all gifts.